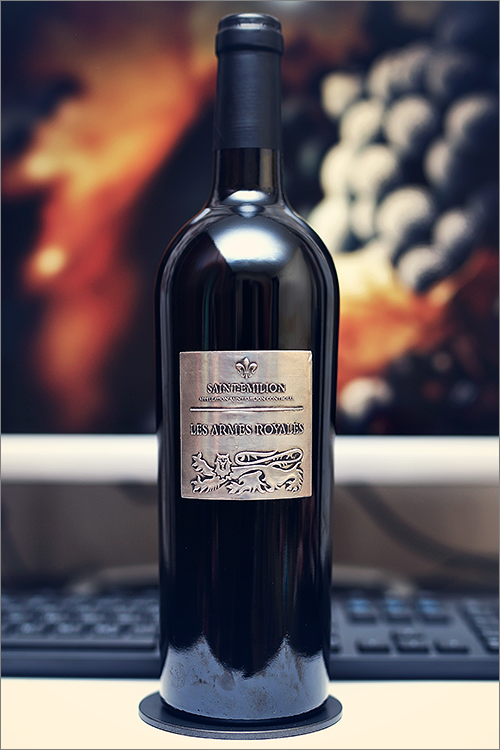 Today we are going to review another classic wine blend from the Bordeaux‘s famous Libournais region, also known as the “right bank” – Saint-Emilion 2014 from Les Armes Royales. This wine is a blend of merlot, cabernet franc and cabernet sauvignon grape varieties, one of the most copied wine blending formula all over the world. The “right bank” is famous for its red clay soils, that produce bold and plummy red wines with a firm dominance of merlot variety in the blend. The most well-known and sought after sub-regions are Pomerol and Saint-Emilion, that generally produce moderately bold and supple wines, with softer, yet more refined tannins. Bordeaux in fact is a region that was a source of inspiration to many of today’s popular red wine blends, this is why we’ve decided to dig deeper into the region and find out how good those wine really are! Deep and noble garnet color, with elegant ruby hues towards the rim of the glass. The nose is strong, filled mostly with ripe black fruits flavours and savory notes: sour cherry, leather, blue plum, black cherry, overripe blackcurrant, blackberry, lolyberry, ripe black raspberry, black mulberry and almond. An instant later the nose is filled with delicate and elegant notes of thyme, nutmeg, white and black pepper, black tea, tobacco, roasted wood, neroli essential oil and some subtle hints of lavandine. The wine is extra-dry, with high alcohol level, high acidity and firm tannin. It feels bold, firm and ripe, with a nuanced tannic grip on the palate. This is a quite seedy, complex and well structured wine, as it tastes overripe, seedy and savory at the same time. The wine has a good overall balance between its fruity and earthy vectors. It has a long finish and an balanced, elegant and seedy aftertaste. This is definitely a great Wine of France and the overall rating says the same, with 91.9 points scored it is right there, among the best wines we’ve tasted so far. Please click on the chart icon on the left in order to get to the wine rating page, where you can find all the wines we’ve tasted to date. Conclusion: this is a wine in its prime form – definitely ready to drink now, a wine that is about as noble as a red blend can get – nunced, rich, and elegant – a mix of savory flavours and overripe fruit! It has a fine tannic grip on the palate, with a quite textured character on the mouthfeel and a touch of alcoholic warmth showing through. It has already developed into a genuine, fully mature wine blend, yet, it can stand another 2 to 3 years of bottle ageing without too much fuss. We would recommend to pass on the ageing and uncork it sooner rather than later, and if you are looking for a nice wine and food experience, simply pair it with spicy and sweet-sauce-based meat dishes, like for example a filet mignon with peach and mango cilantro sauce or a butter-roasted beef tenderloin with horseradish and caramelized onions. Salute!